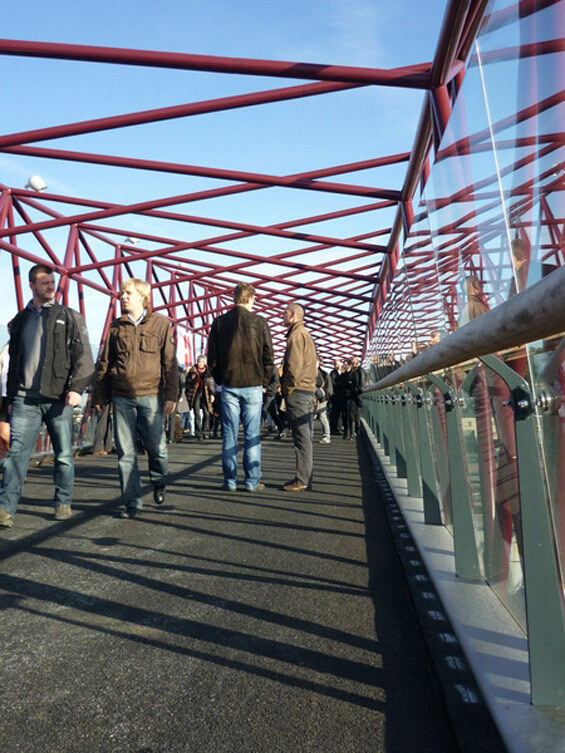 The first completed project of the urban renewal project ‘Aarschot on tracks’ is Pedestrian Bicycle Bridge by West 8. From now on, it serves not only as a ‘landmark’, but it also breaks the barrier effect of the rail tracks. It connects the city with its old and new parts. 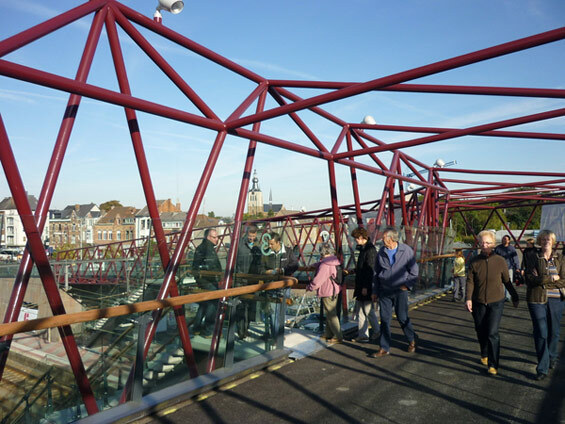 This pedestrian bicycle bridge over the tracks is now an indispensable link in the city cycle route. It becomes an essential part of the supra-local functional cycle network. The bridge offers bicycle link next to the function of an additional full access to the various platforms and the adjacent train station parking. The wide ramps meet the standards of the bicycle guide and guarantee comfort for all users. A gentle slope of 280 meters connects the different parts together. The bridge portion has a total length of 112m and is supported by 5 sculptural columns. Multifunctional use of space allows the slope below to park about 400 bicycles and to accommodate the office of non-profit organization Velo. 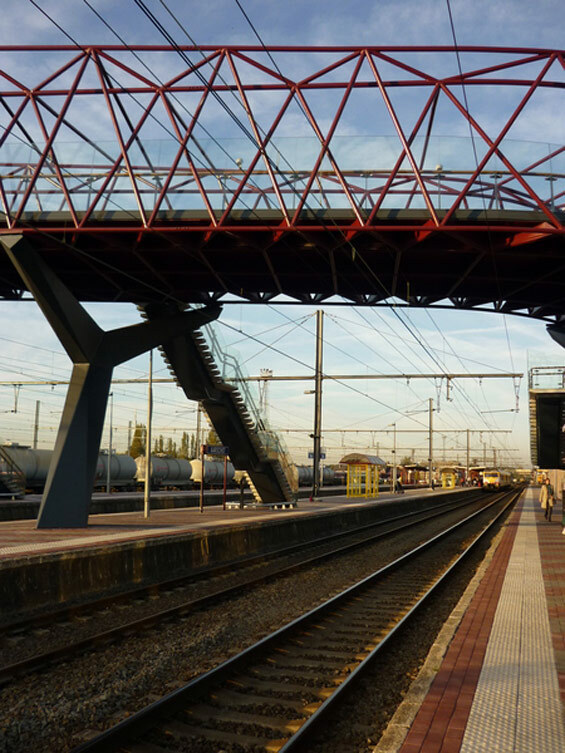 The new bridge transcends its purely functional nature, and next to the new station area, to an attractive lounge with numerous perspectives for the city and its surroundings. Its appearance is stunning with sustainable and high-end materials like natural stone, steel and glass which are used in their most natural appearance. 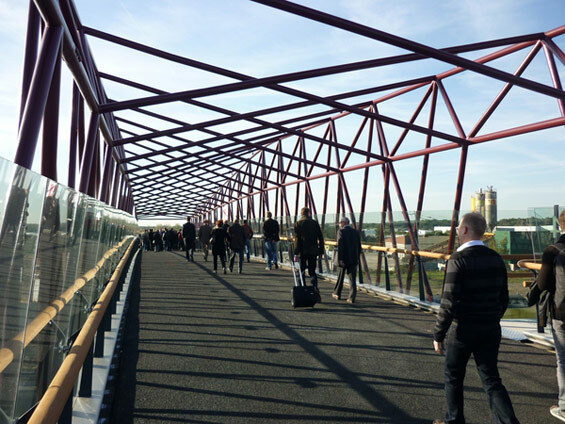 The bridge was opened on Friday, October 14, 2011 in the presence of all parties and Minister of Civil Service and Public Enterprises Inge Vervotte. The city of Aarschot in recent years has been active in remaking the city into a more inviting place. 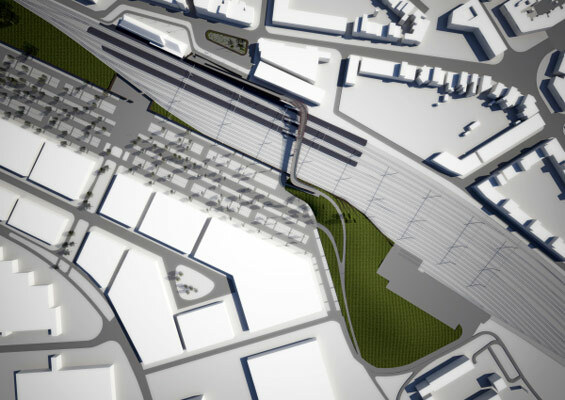 This involves not only the reconstruction of the Market but also in urban renewal projects such as ”s Hertogenmolens and Amer’ and ‘Aarschot on tracks’. ‘s Hertogenmolens and Amer is now beautifully restored and redeveloped into a hotel. The Demer Bank which locates next to the building is transformed into a pleasant promenade along the Demer, which provides now a quality environment for a delightful lifestyle. Another major part of the whole urban redevelopment project is the station area Aarschot. The station area Aarschot has the potential to grow into an attractive district with high quality urban housing and labor-intensive activity but it needs a thorough approach to transform the old desolate look of the rear side of the station area into an attractive second entrance. Financed by the Flemish government with 2 million euros budget, the city of Aarschot was able to take some concrete actions: part of the industrial area Kop van Nieuwland, behind the station, is transformed into a labor-intensive business area with high-quality architectural appearance. Between Kop van Nieuwland and the station, is now a ample parking area for 1,300 cars. 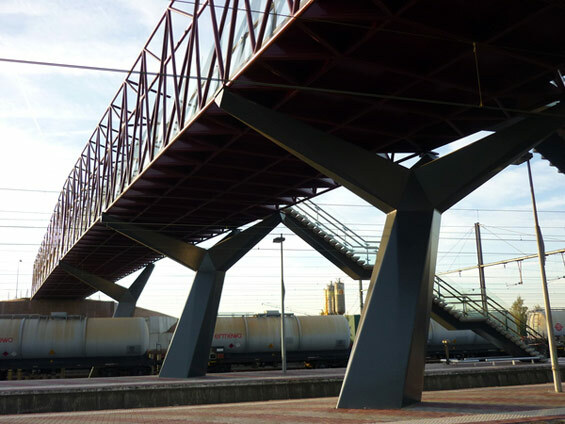 Right through the car park is a pleasant walking and cycling path between Demer and Elzenhof, together with the bridge over the tracks, a physical relationship with the city is being laid out. 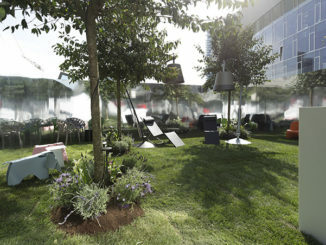 The center is addressed with the redesign of public spaces and development of the Captain Gilson Square, which is a gate to the city, and the station area in particular. I love these kinds of projects, networks of connectivity. Having grown up in Belgium, the lack of habitat connectors is astounding. I would have liked to see more emphasis in this area of the project, perhaps this is alluded to in a larger scale plan which seems to be missing. What are the other components of this urban renewal project?